Tragic US student Otto Warmbier who died from acute brain damage sustained in North Korea was a real life trophy for Kim Jong un. Apart from his realistic but ridiculous propaganda videos, the North Korean dictator has not really been able to come near America or Americans. But with the unfortunate student, he had a powerful propaganda tool—and he used it horrifically. The 22 year old Warmbier was accused of espionage and sentenced to 15 years hard labour for stealing a propaganda poster from a North Korean hotel. But he was released from and sent back to the US after suffering severe neurological damage. He died in a Cincinnati hospital last week. His death was confirmed by his family in a statement via the hospital he was staying in. 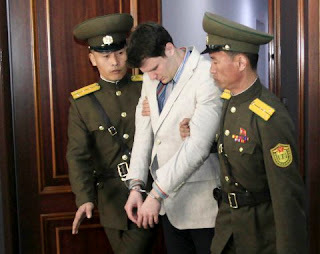 Kim's regime claimed they released the University of Virginia student on humanitarian grounds. They also revealed he had been in a coma since the day after he was sentenced to prison. The controversial nation has a history of torturing and killing prisoners and Many believe Otto was tortured and gravely injured during the process although North Korean officials claim the student swallowed a sleeping pill that caused him to go brain dead, many seriously doubt that. But the curious thing is that when he was returned to the US, their was not a single sign of skull damage, infact there were no signs or marks on him at all.